Everyday starts out the same: I'm at work and I eat a highly fattening scone for breakfast as they come dancing out of the oven with their tantalizing scent! (dramatic, right?). Once I get past breakfast, I typically manage to eat a healthy lunch. Usually, it will include fruits, veggies and a small sandwich. Not too bad. The problem comes in the evening. I come home from work, ravage the fridge and cabinets and I eat until its time for bed. Even if all of that food was healthy (which it isn't), I would still never lose any weight this way. And that's why I HAVEN'T lost any weight. I am trying so hard to reform this. It's my biggest downfall when it comes to food and health. What are some of your struggles with food? What do you do that prohibits health and/or weightloss? I LOVE learning how to make things so I no longer have to buy them from the store. I guess I get that from my mom. She makes her own soap, face wash, lotion, and home cleaners. She also makes her own yogurt and other foods (too many to name here!). She is awesome at what she does and I am so proud of her. One day, I would like to be like her. My creations tend to be food-based. I make my own salsa, I usually don't use any sort of recipe when I cook meals, and I make my own ranch dressing. I love that my ranch is not processed or filled with preservatives (though it does have some, since the mayo I use isn't completely preservative free). I love that it is low fat and very low calorie. I also think it tastes better than anything you will buy in the store. Test it out for yourselves. Combine all of these ingredients into a bowl and stir vigorously until the texture is smooth and creamy. Pour into an airtight container and store in the refrigerator. This ranch has a shelf life of about two weeks, since I don't add any preservatives to make it hold for long periods of time. Trust me, this is better for your body. 1 serving= about 32 calories. Most store-bought ranches are about 65 calories per tablespoon! 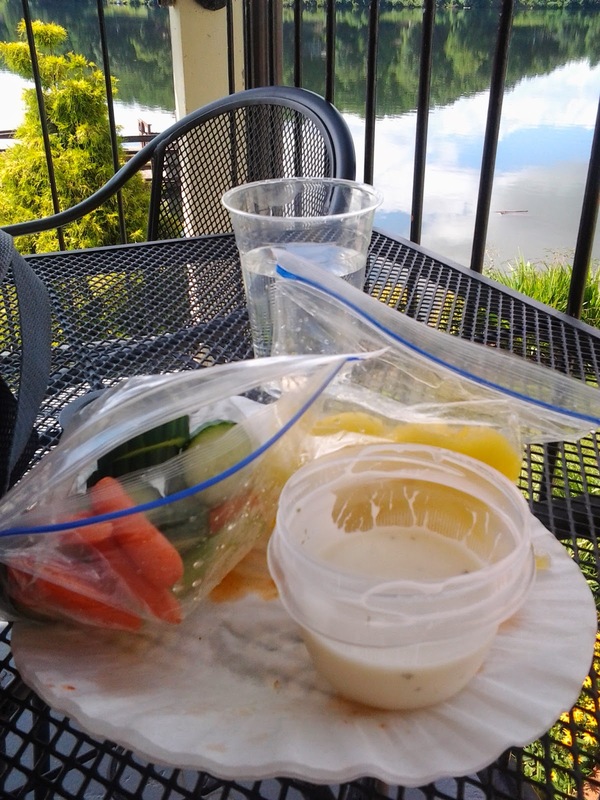 Lunch break by the Lake: My home-made ranch with organic baby carrots, English cucumber, and yellow peppers. YUM! We sometimes experience the same issue when we come home from work and are too tired to cook! I TRY to eat breakfast in the morning (toast, yogurt with blueberries, a bagel-- whatever we have) but often end up having to skip because I sleep in. I'm trying to get better about eating breakfast. For lunch, I normally make a PB&J and try to bring one or two pieces of fruit (usually an orange, plum, banana, etc.) Because of my job, I sometimes end up having to eat out, but try to pick a salad or something-- while my choices are more limited, it also makes choosing a healthier meal easier since I never eat fast-food meat. Dinner is the hardest for me, too. Normally, at the end of the day, we're both pretty tired and really don't want to cook. We used to eat spaghetti, homemade mac 'n cheese, etc. because they are relatively quick and easy to make. But I have gained some weight since being married and realized that we really needed to cut back on our carbs. We have avoided pasta (we had homemade mac 'n cheese a month or two ago, and made some egg noodles and gravy on our anniversary trip, but otherwise haven't eaten it) and tried to make more salads. I get bored with salads if I eat them too often, so an easy solution for us was to make veggie wraps-- still healthy, but it has a different feel and taste, so we still eat our veggies! We're still learning, and trying to exercise more (we've both neglected it pretty badly since we've been married), but we're trying! I really need to get back into the routine of getting up earlier for my coffee, prayer and reading time before work like you do! Sounds like you guys are doing a pretty great job on the eating end of things! I really like the idea of a "Friday night reward". I may suggest that to Taylor. I have been exercising more because I get a free pool membership with my job and I LOVE water, but when the pool closes, exercise won't come as easily to me. As far as getting up early to pray and read, the reading part is kind of non-existent to my life right now. Taylor and I try to read together, but I tend to be too out of it in the morning to read. Changing your shoes right away can help with your feet, or at least it does for me. It doesn't really matter what I change to, it's just a different insole and the wear points will be slightly different and can make your feet feel better. Just find something to distract yourself and break the cycle and let yourself unwind a little before you're faced with the temptation of snacks.